Portsmouth has three theatres these are the Kings Theatre, The New Theatre Royal and the Guildhall. First we will look at the Kings Theatre which is located in Albert Road and is of a similar design to many West End Theatres in London. Frank Matcham designed the Kings Theatre as well as many West End Theatres in London. 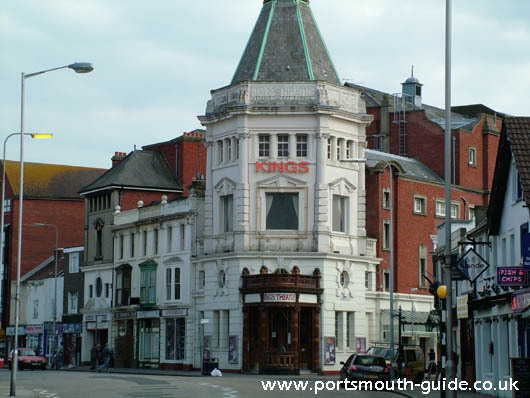 The Kings Theatre became the third theatre to be owned by the Portsmouth Theatre Company, the other theatres were the Theatre Royal and Princes Theatre. The King’s theatre opened its doors on 30th September 1907. The Portsmouth Theatre Company continued to run the Kings Theatre until 1964 when Commander Reggie and Mrs Joan Cooper purchased it. It again changed hands in 1990 when Hampshire County Council purchased the theatre and leased the theatre to Mrs Cooper and Mr Barnes. The Kings Theatre has a Italian Renaissance style of décor and is an example of an Edwardian playhouse. The Kings Theatre has had many prior to London productions in more recent times. 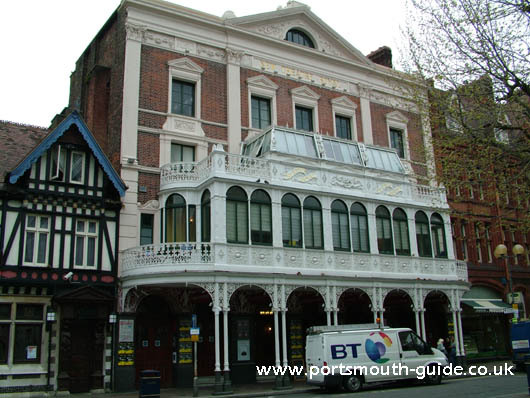 In 2001 after a campaign to keep the theatre open it was purchased by Portsmouth City Council and leased to The Kings Theatre Trust who have restored and repaired the theatre. The trust have leased the building to an operating company called Kings Theatre Southsea. After 18 months the Kings Theatre Trust had to take back control of the theatre due to the Kings Theatre Southsea going bankrupt. Over the years the Theatre has changed little. The front of the building has altered slightly, but apart from a few advertising boards and signs, the look is almost original. The lady statue, originally mounted on the top of the Tower, and later standing on the top of the Portico at the entrance to the Theatre, was lost for many years and only found again by chance in 1998 in a Hampshire scrap yard. She has been restored and returned to her original position. Inside the theatre, the colour scheme has changed from gold, cream and blue/green to gold, cream and red. The seating has not changed much either, although the original maximum capacity of 2187 has been reduced over the years to 1600 to align with modern safety requirements. Backstage, all scenery is still flown and managed by hand without the benefit of mechanization or counterweight, although much maintenance and repair has occurred in recent years. Over the years the theatre has changed little. The Box Office is now computerised and backstage the scenery is still flown and managed by hand, although a motorised flying system has been installed. This has meant that a wider variety of bigger shows can be hosted. Actresses Kate O’Mara, Dillie Keane and Lisa Riley are proud to be patrons of the theatre. The kings theatre is a really nice example of a Victorian music hall that has changed little and is still very active as a theatre. For more information about the Kings theatre or for its schedule have a look at www.kings-southsea.co.uk . Now lets have a look at the New Theatre Royal in Guildhall Walk. In 1856 the building that stood beside the White Swan Tavern was converted for use as a theatre and was completely remodelled in 1884 so that the present building dates back to the Victorian theatre age. For thirty- two years there were comedies, dramas and operas shown here. In the thirties the talkies spread through the country and the theatre royal became a cinema. In 1948 the building became a theatre again, this time its role was mostly as a music hall. In 1960 the theatre became a wrestling arena and this lasted for six years. In 1968 the theatre was saved from demolition and in 1972 the building was set on fire by a group of children which left the stage area destroyed and dressing rooms badly damaged. The theatre now has modern equipment and facilities backstage while still having an original auditorium. For more information about the New Theatre Royal have a look at www.newtheatreroyal.com.